Stan ZL2ST has been my neighbour across Auckland Road in Greenmeadows for the past 8 years. It’s been fun but Stan is downsizing and moving to another part of Napier after 14 years. 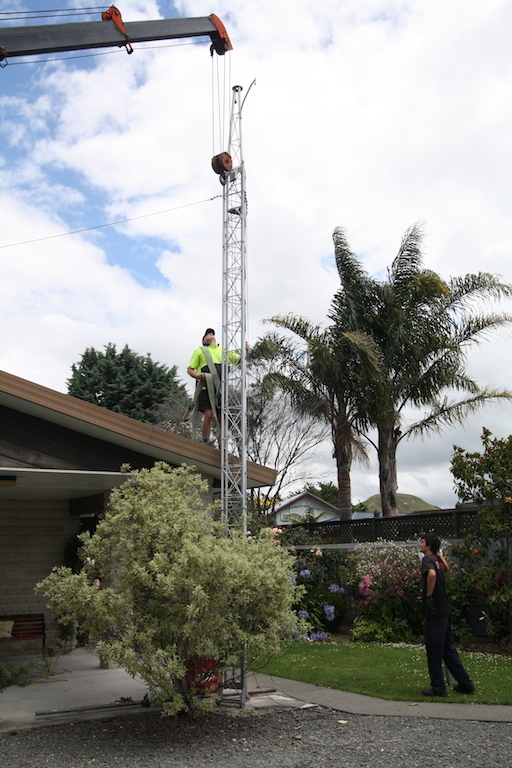 His tower originally had a fine Tri-Band yagi on top but a snarky neighbour two houses away decided he didn’t like the look of it and the NCC was unforgiving of course and the yagi came down. 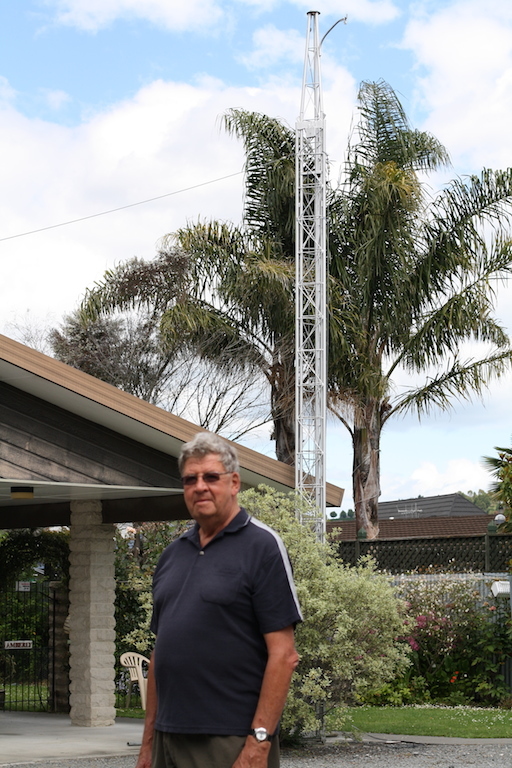 The tower didn’t so Stan made the best of a bad situation and worked DX the hard way with wire antennas over the past many years. There wasn’t a lot of DX that got by him. It was interesting at times with the two of us after the same rare station on the same band at the same time. Both of us ran high power but somehow we ended up taking turns calling and we both usually worked the DX. When I heard something interesting on, a quick phone call and Stan would be in the hunt. I called AFTER I worked the DX of course! Unfortunately, the tower is not making the trip to the new abode and has been donated to another local ham. It only took an hour to be removed. 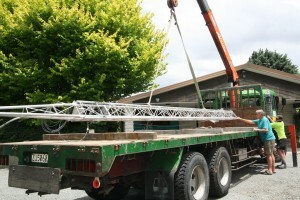 A crane made short work of the job and was soon seen driving away. I could see Stan’s tower each time I walked out my front door. It just doesn’t seem the same any more with that big gap in the sky. Good luck with your move Stan. I will miss your extreme DX signals from across the road. Chair: Laurie ZL2TC, the meeting started at 7:30 pm. Apologies: ZL2DW, ZL2DC, ZL2LF, ZL1FS (ZL2UFS). Accepted ZL2ST,ZL2AL. Present: Lee ZL2AL, Mike ZL2MY, Willy ZL2AGD, Wally ZL2MO, Bert ZL2OC, Revell Troy, Dave ZL2MQ, Stan ZL2ST, Rob ZL2US, Jan ZL2CZE, Marty ZL2PX, Karl ZL1TJ and visitors Hannah and Otto Soderlund AG6KR and AG6KQ. Minutes of the previous meeting, confirmed correct: ZL2AGD, ZL2TC. Letter the Napier City Council regarding the ground lease for the club rooms..
Finance: Napier City Council annual lease account paid. 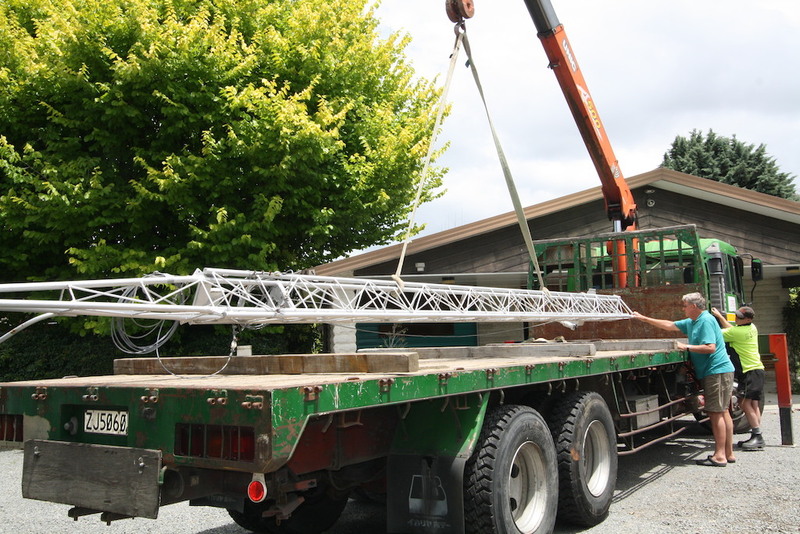 Payments for repeater and beacon licences are now due. Laurie welcomed visitors Hannah and Otto Soderlund, AG6KR and AG6KQ, members of ARALB, Associated Radio Amateurs of Long Beach, California. Otto was given the opportunity to say a few words and spoke about the ARALB club, and it’s involvement with SS Queen Mary, now used as a hotel at Long Beach. Club members do regularly act as hosts and guides to visitors to the ship’s ancient and very large radio room, station W6RO. 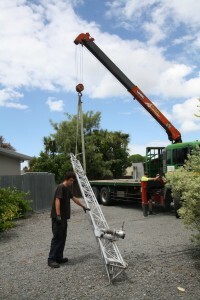 A year long journey travelling through Australia and New Zealand brought them to NZART headquarters in Upper Hutt where Debbie ZL2DL recommended a visit to Branch 25, Napier.xThe journey is now nearly complete and both Otto and Hannah are looking forward to going home and having a fully equipped shack available once more. Stan and Lee reported on the ZM4T contest group participation in the most recent CQ WW CW contest, the group beat the NZ record amongst others. Stan, finding it ‘painful’ working through the night, obviously still enjoys the adrenaline rush. Otto asked about equipment used. Lee referred to the ZM4T website. Mike ZL2VM wrote a report regarding the Civil Defense station and the proposed need to upgrade the amateur radio radio there. Laurie suggested to postpone discussion till Mike can be present. The bottom line suggestion in the paper is to seek a discussion with CD leadership first. Wally ZL2MO reported on progress with the paint job, pricing and samples at this stage. Lee showed has latest QSL card, great design and beautifully executed in Russia, 2000 cards for the princely sum of NZ$ 120 including freight. After which Jan ZL2CZE showed his latest acquisition, two ex Chech army 6 meter transceivers, bought at an army surplus store during a recent trip to the old country. These locally made RF10 sets, QRP (1 Watt or so), FM, frequency range 44 to 54 MHz programmable in 25 Khz steps sell for the equivalent of NZ$45. 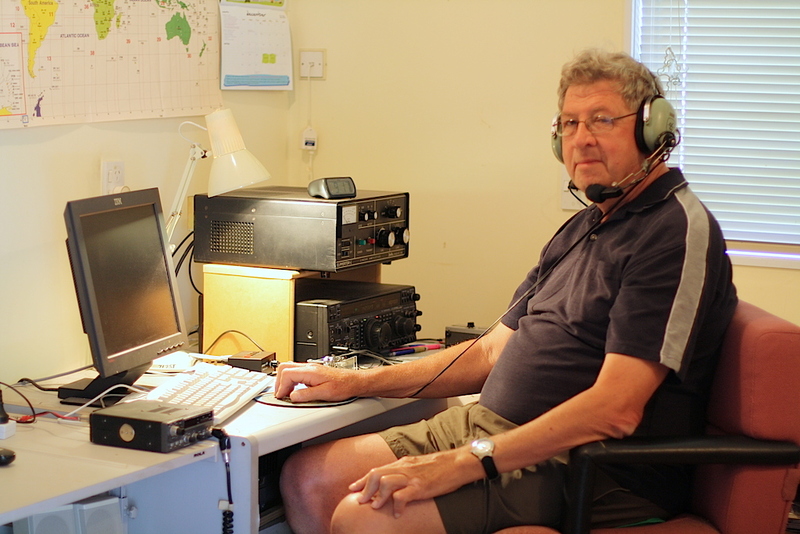 Lee then set up his gear and ran the dvd record of the A52A Bhutan Dx-pedition. Produced by James Brooks, another quality film, not only highlighting the trials, tribulations and fun times of the team led by Glen Johnson W0GJ but also a fascinating report on Bhutan and it’s people today. Thanks Lee, a great way to round the evening off.